Want to submit an article to the Journal? Find out what kind of pieces we’re looking for and requirements for submission. The Natural Areas Journal — the flagship publication of the Natural Areas Association — is the leading voice in natural areas management and preservation. It also includes writing on conservation issues, forums, topic reviews, editorials, state and federal natural area activities and book reviews. In addition, we publish special issues on various topics. 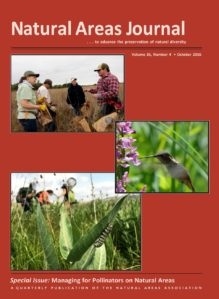 Natural Areas Association members receive a subscription to the Journal as part of the benefits of membership. Members can access their online issues by logging into the member-only area of this site. Join to start receiving issues, or access a sample article. We’ve got a special deal for you – two popular special issues, Managing for Pollinators on Natural Areas and Using Native Plant Materials in Restoration, are available together at a special price. Learn more. Interested in back issues of the Journal? Order here.